Cryptococcus neoformans is a yeast with prominent polysaccharide capsule. It is an opportunistic fungal pathogen notoriously known as the most common cause of fungal meningitis (infection and inflammation of the meninges) in immuno-compromised patients (such as people with AIDS). It reproduces by budding and the single buds are characteristically narrow at the base. It does not produce pseudohyphae (Candida albicans does). It is ubiquitous saprophyte often found associated with bird droppings, especially of pigeon. Infection is initiated by inhalation of the yeast cells. The primary pulmonary infection may be asymptomatic or may mimic influenza like respiratory infection often resolving spontaneously. In immune-compromised patients with impaired T cell immunity, the yeasts may multiply and disseminate to other parts of the body but preferentially to the central nervous system (neurotropic), causing cryptococcal meningitis. Other common sites of dissemination include the skin, adrenals, bone, eye and prostate gland. The inflammatory reaction is usually minimal or granulomatous. Anti-phagocytic: Polysaccharide capsule contains compounds that are not recognized by Phagocytes. Protection under drying condition: The capsule collapses and protects the yeast. Ideal size range for alveolar deposition: the cell size reduction, resulting from capsular collapse, places the yeast in the ideal size range for alveolar deposition. Phenoloxidase: This enzyme is responsible for melanin production. Melanin is might act as a virulence factor by making the organism resistant to leukocytes attack. It has been found that increased melanin production can decrease lymphocyte proliferation and tumor necrosis factor production. Phenoloxidase also protects the organism from oxidant released by phagocytic cells. Cryptococcal meningitis: Only in a small proportion of cases, hematogenous spread results in subacute or chronic meningitis or meningoencephalitis. All untreated cases of cryptococcal meningitis are ultimately fatal. About 5-8% of patients with AIDS develop cryptococcal meningitis. Lung infections: Pulmonary disease is increasing nowadays particularly in immunocompromised host. Reactivation of old healed lesion may occur. Skin and other infections: Sometimes skin, lymph nodes, bones are involved. Specimens: Specimens depends on clinical presentation and suspected disease conditions. Common specimens include spinal fluid (CSF), tissue, exudates, sputum, blood and urine. 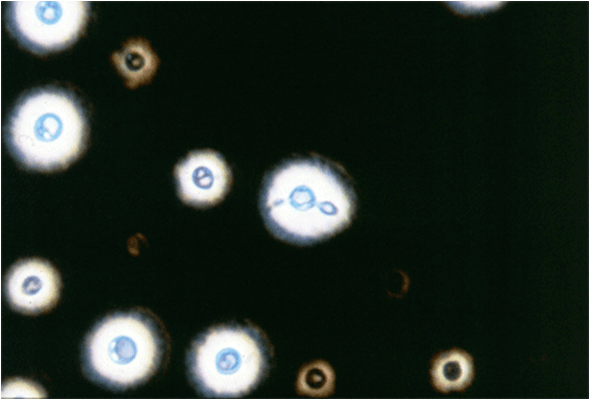 Microscopy and staining: Cryptococcus neoformans appear as a spherical, single or multiple budding, thick walled yeast that is 2-15 μm (wide variation in size) in diameter. It is usually surrounded by a wide refractile capsule. India ink preparation is used as a rapid and inexpensive diagnostic tools of detecting cryptococcal infection in many institutions and resource poor settings. Demonstration of heavily capsulated yeast cells (see the image) in CSF, exudates and urine establishes the diagnosis. India ink preparation when positive in CSF is diagnostic of cryptococcal meningitis but its sensitivity is low. Many diagnostic laboratories have replaced this test with more sensitive cryptococcal latex agglutination test. Culture: Colonies develop within a few days on most media (e.g., Sabouraud’s dextrose agar) at room temperature or 37 °C. Cryptococcus neoformans is sensitive to cycloheximide so media containing cycloheximide should be avoided. Other culture media are Blood Agar, BHI Agar, Bird seed agar etc. Colonies in SDA are creamy, white and mucoid (because of capsule). Identification: Cryptococcus neoformans is identified by urease production and carbohydrate assimilation test, and confirmed by direct immunoflurorescence using a fluorescein-labelled anti-neoformans antibody. Detection of Antigen: Tests for capsular antigen can be performed on CSF and serum. Latex agglutination test is most useful in detection of cryptococcal polysaccharide antigen. Slide latex agglutination test has sensitivity of 90% in the cases of cryptococcal meningitis. Detection of Antibody: Serum antibodies can be detected by agglutination and immunofluorescence. Molecular diagnosis: Not common for diagnostic purpose. Only pathogenic yeast known to have a polysaccharide capsule. India ink preparation and cryptococcal antigen agglutination are commonly used diagnostic methods.